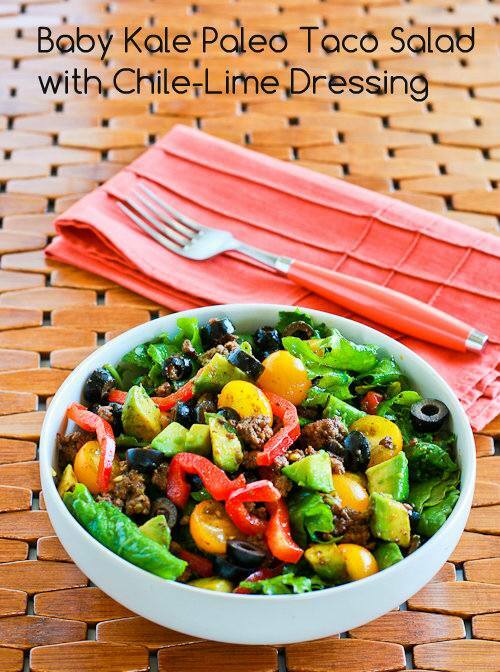 Baby Kale Paleo Taco Salad with Chile-Lime Dressing has all my favorite taco salad flavors! Ever since I fell in love with baby kale, I've had fun experimenting with it in different salad combinations, and this Baby Kale Paleo Taco Salad with Chile-Lime Dressing is another baby kale salad that I loved. The word Paleo in the recipe title means I think this salad will work for the Paleo or Primal way of eating. (When I told my friend Bonnie about this salad, she asked "What is Paleo?" so click that link if this is new to you as well.) Since Paleo eating fits so perfectly with my commitment to low-carb and low-glycemic foods, and quite a few of my friends are embracing it, I decided it would be nice to feature Paleo Recipes once in a while. The recipes that I think Can Be Paleo are also collected together, for those who are interested. (I'm calling that category "Can be Paleo" because I'm including recipes that can easily be made Paleo with minor adapting. If you don't care about Paleo eating, you could add a little grated low-fat cheese to the salad; either way it's delicious!